Illustration Magazine (Issue 49) usually has two big features. In this issue, one is about Pulp artist John Newton Howitt, and the other is Stevan Dohanos, the illustrator who produced 125 Saturday Evening Post Covers and was one of the founding instructors of the Famous Artist's School. The article on Dohanos follows his life story from his start in 1907 in an Ohio mill town to his death in 1994. His Post covers captured stories of American small town life with humor, affection, and lots of detail. Getting a Post cover idea approved wasn't easy. Dohanos estimated that for every cover idea that got the green light, there were four other sketches that were rejected. Dohanos painted primarily in gouache, a medium that lends itself to speed, clarity, and detail, and one that he learned during his early days as an advertising and layout artist. The article by Illustration Magazine founder Dan Zimmer has over 30 pictures by Dohanos, most of them reproduced from the original. Volume 2 of Dan Zimmer's popular "The Golden Age: Masterworks from the Golden Age of Illustration" is still available, but it's selling out fast. Illustration Magazine, as important and useful as it is, doesn't fit my budget as a regular purchase, but I just had to pop for this one. 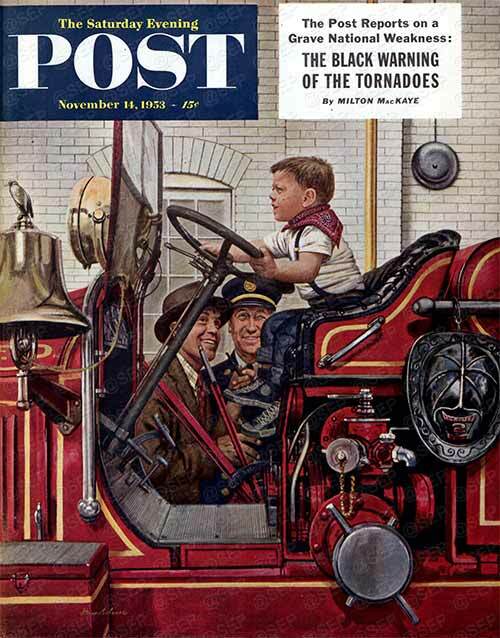 The Dohanos images (and the article too, I'm sure) are wonderful reminders that Rockwell, good as he was, wasn't the only game in town for these sorts of images. I look forward to it. I agree with your statement about Gouache lending itself to clarity and detail, but so far in my very limited knowledge of the medium, I'm super slow at it. I trust your judgement though, your amazing work proves that. And your indication that Gouache can be fast is very encouraging. I wonder how the Gouache compares to Oil (alla prima) when it comes to speed? At chris: Gouache probably beats oil big time in terms of speed, clarity and reproductivity. Though the variable speed may be similiar the interaction can only be achieved with gouache from the standpoint of any illustrator. I think my answer is correct. One thing that i am often insecure about is the shadows in gouache. The defining cast shadow on the red hydrant would be laid in rather transparently in oils ,i think (especially when being on a tight deadline as an illustrator). Here it seems as if it was done as thickly as the light part. Maybe someone else can voice his opinion on that.